So far as I know, however, nobody in Rome itself has seriously proposed rebuilding the Forum. As of now, it has been a very ruined ruin for many centuries. I would put the chance of its restoration well below that of Penn Station, the hope of all who are interested in the classical revival. On the other hand, it seems as if the Parthenon itself, in Athens, is in the process of restoration right now, though I’m not sure whether this project, which has lasted for a number of years if not decades, aims at anything like a complete restoration of the Parthenon, the Erechtheion and the rest of the Acropolis. Even as a ruin the Acropolis – the main civic gathering of the Athenian city-state – is certainly more legible to the average tourist or normal citizen than the Roman Forum, which is mainly some difficult-to-distinguish ruins with a couple partially ruined colonnades standing around. A website called Jeff Bondono’s Page, from which the image above was taken, gives a good idea of what it might have looked like at the height of Imperial Rome. All history is encamped about us and all history sets forth again from us. This does not apply only to Roman history, but to the history of the whole world. From here I can accompany the conquerors to the Weser and the Euphrates, or, if I prefer to stand and gape, I can wait in the Via Sacra for their triumphant return. Of course, not all of us have the power of Goethe’s imagination. 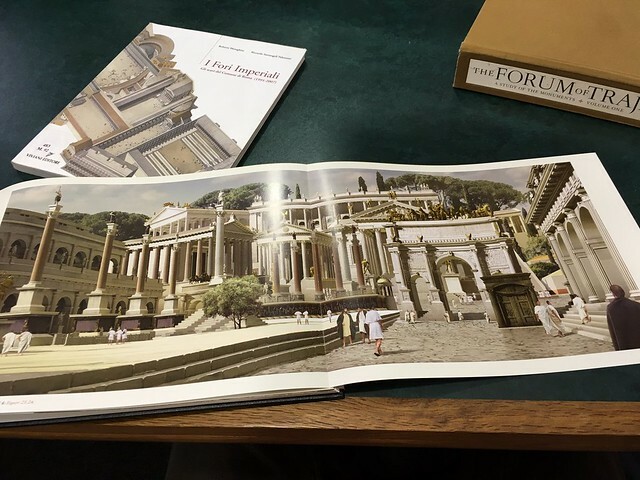 The best case for not restoring the Forum to its ancient form (pick your era!) may be that even the most exact replica must, because we all will know it is a replica, undermine the possibility of the sort of mental time travel that Goethe could experience even amid ruins. I would argue that rebuilding the Forum as it was in, say, A.D. 300, before it was sacked over and over again by barbarians and its own citizens, would be a valuable experience for those of us who are not Goethe. Indeed, the best of both worlds might be possible by preserving the Forum ruins as they are and rebuilding the Forum in or outside of Rome. Of course, that might tempt mod-symp ignoramuses to bloviate about the Disneyfication of history. In the effort to reconstruct the Parthenon, it seems as if parts that cannot be restored using the original stone lying around it, of which there is quite an abundance, new marble is being cut to fit. Although experts say it will blend in after enough aging and weathering, how long will that take? I have my doubts. That’s another argument to let sleeping ruins be. Much as I like the idea of rebuilding the Forum, I’m not sure what the best course would be. It’s a more difficult question than that of rebuilding Penn Station, whose grand hall was modeled after the Roman baths of Caracalla. Of such a restoration’s advisability, however, there is no doubt whatsoever. This entry was posted in Architecture, Preservation, Uncategorized and tagged Eric Stalheim, Fallen Glory, James Crawford, Notre Dame School of Architecture, Parthenon, Penn Station, Preservation, Roman Forum, Rome, Steven Semes. Bookmark the permalink. It would be great if they could rebuild the forum, but right now Italy’s economy is under water. They have to support thousands of migrants who are coming from North Africa and the country has little money for a project like that. 2). 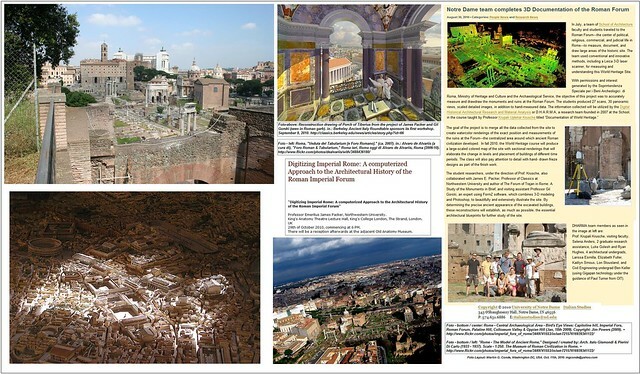 ROMA ARCHEOLOGICA & RESTAURO ARCHITETTURA: Prof. James E. Packer,” Digitizing Imperial Rome: A computerized Approach to the Architectural History of the Roman Imperial Forum.” James E. Packer, Professor Emeritus Northwestern University (2010). (11 OCT. 2010). 3). ROMA ARCHEOLOGICA & RESTAURO ARCHITETTURA: Prof. Arch. Gilbert G. Gorski & Prof. James E. Packer, The Roman Forum (2015). The James R. Wiseman Book Award, A.I.A., Boston, Mass., January 6, 2018. Foto: Fonte | Source: J. E. Packer (01/2018). It certainly seems more could be done with the Roman Forum(as well as other more or less intact ancient Roman structures in Rome) , but a master plan made by a consortium of architects, experts and planners ought to be made answering questions about what should be done, how much, and what the function of the Forum ought to be other than just some Disneyfied tourist attraction. Mussolini took the step of doing some restoration of the Senate (also in the Forum) in the 1930s, but just how much restoration of the other temples and buildings is enough? Before any headlong plunge into restoration is done, long and careful deliberation must take place. I myself think that the Temple of Jupiter ought to be rebuilt since most of what remains consists of 3 columns. As far as the Parthenon is concerned, I think there had been a major restoration of the ruin within the past 20 years, but is still a “ruin” with no plans for a full reconstruction much as we may think there ought to be. I think Turkey should help pay for it as their navy “accidentally” did the damage in the 17th century with which we are basically left today. David, I believe the thrust of Eric Stalheim’s master’s thesis is precisely what you propose – it looks into the way any thoroughgoing restoration of Rome’s antiquities should be seriously master-planned to determine how much restoration is appropriate and where. I have no doubt that preventing “Disneyfication” is a paramount concern – assuming by that term is meant a sort of cartoonish commercial restoration. A literal restoration based on research and respect for the original is not Disneyfication – except in the minds of modernists, for whom such a respectful, well-researched reconstruction is the greatest possible threat to their interest in letting sleeping dogs lie. Rebuild the Roman Forum virtually. Several VR firms already have. Penn Station should be rebuilt and Richard Cameron should oversee the reconstruction. I agree, Rodney, about rebuilding Penn Station, of course, and I agree that rebuilding the Forum virtually is commendable. But I don’t think the latter stands in for rebuilding the Forum in actual reality, whether in place or on some expendable acreage elsewhere in Rome. Tough question! These are very different proposals. The Forum and the Parthenon are lying in various stages of ruins, but they’re still there. Penn Station, OHOH, was hauled off and replaced with something hideous. I favor rebuilding it. I agree, Steve, although it might be added that Penn Station is in fact a ruin with a sports arena on top. Its platforms, tunnels, foundations and other deep infrastructure are, as I understand it, leftovers from the old Penn Station – still in use, however, unlike the remains of the Forum and the Parthenon. I’ve seen Worcester’s station. Very nice.